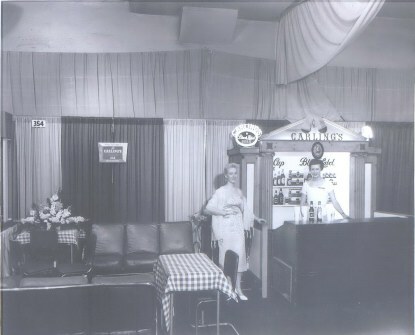 It was in 1949 that bartenders and truck drivers first heard themselves called "Mabel." Mildly shocked and amused at first, they soon realized they were a part of a marketing and merchandising revolution in the brewing industry. And driver salesmen, bartenders, waiters and waitresses had all joined in the spirit of friendly fun that made the "Mabel, Black Label" jingle one of the most memorable and successful advertising and sales jingles in early television history. A very special thank you goes out to Terry & Laurie Roncagli for the pictures of Laurie's mother Lucille Schroeder as the ORIGINAL Mabel. The picture below are the only know picture of the Lucille Schroeder Mabel. 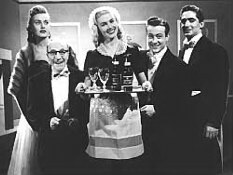 Lucille, the original Mabel, was a brunette, but Carling and the producers wanted to go with a blonde Mabel, so Lucille obliged by dying her hair. Since then, millions of people through the United States and abroad have acquired a speaking acquaintance with "Mabel". 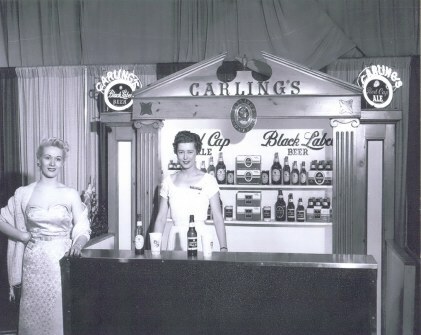 The Carling Brewing Company credited her with playing a significant role in its rapid, steady climb from the ranks of the also-rans to leadership in sales of beer and ale.The consumers attention captured by the simple rhyme, beer drinkers by the thousands tried Carling Black Label Beer and found they liked it. They bought more Black Label, and Black Label sales began their spectacular growth. Out of this happy state of affairs came the knowledge that people were buying Black Label because they liked it; they liked the quality, they liked the flavor. 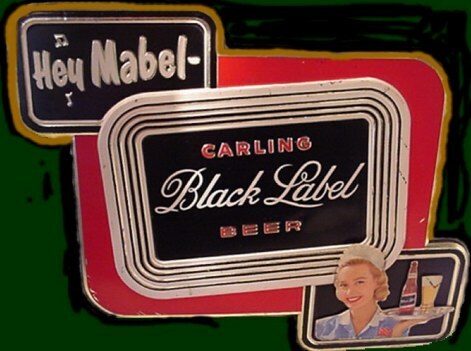 Although from time to time other advertising themes have been introduced, and variations supplemented the original theme, "Mabel" has been an integral part of Carling Black Label. 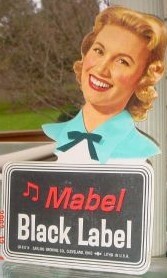 Even on the Pabst.com web site today, Mabel is still there with her tray of Black Labels and that lovely smile. The sustained use of a single advertising theme over so many years was unique in the advertising business. Musically, "Mabel" changed her tune many times and swung gracefully from waltz to square dance. She first winked when television came on the scene and she made her debut in an animated cartoon. 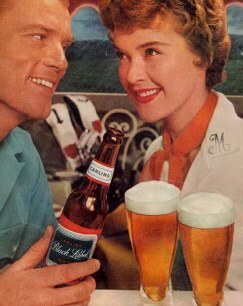 The "Hey Mabel, Black Label " slogan was created by the Cleveland firm of Lang, Fisher & Stashower. They were the long time ad agency for Carling. At first, the slogan was used in radio spots. Soon after, the slogan was used on practically every piece of Carling advertising material. There are claims that Carling was not all that thrilled with the slogan at first. It seemed too simplistic for them and they rejected it at first. It was only after the urging of the ad agency that Carling accepted the new slogan. A receptionist at a Cleveland television station was the first to play Mabel. Her name was Lucille Schroeder. She played the part of a barmaid ,standing next to the sports reporter(who was sitting on a bar stool giving the sports report) with a tray of Carling's Black Label. The next "Mabel" was chosen in 1951 from literally hundreds of models and actresses. Jeanne Goodspeed was a glamorous, but wholesome girl who was attractive to men and acceptable to women. 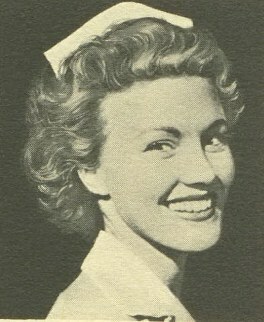 Jeanne played the part of Mabel for the next fifteen years. 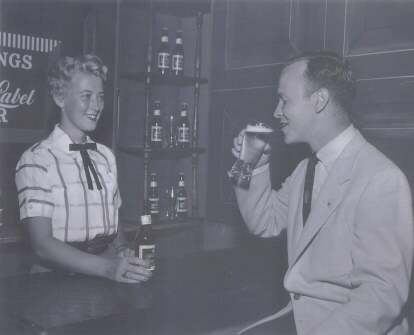 With a live "Mabel" personality, Carling was the first to use a woman to attract the male beer drinker. 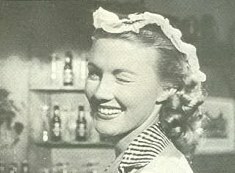 Carling used photographic techniques and beer-drinking situations for television commercials, and Mabel appeared in magazine and other print advertising, too. 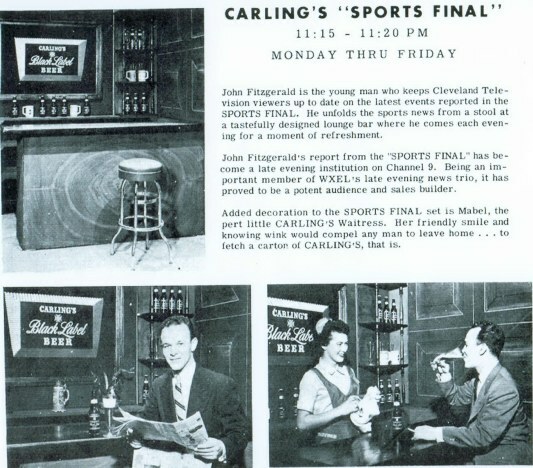 In 1965, Carling Brewing Company ditched thier local advertising agency and hired a New York firm, Tinker & Associates, to take over the Black Label advertising. Mabel suddenly disappeared from the scene. Soon thereafter, Carling would see sales diminish throughout the late sixties. Then in 1970, Carling reintroduced Mabel. They were hoping that Mabel would help save Carling Black Label........again! As Carl Miller said in his book, "Breweries of Cleveland", "Unfortunately, Carling's troubles were even too great for even Mabel to cure "
"Mabel" is still around, but in words alone. For the catchy phrase "Mabel,Black Label" proved to be the thread that weaved all media messages into one strong recall. . . . the call for another round of Carling Black Label Beer. 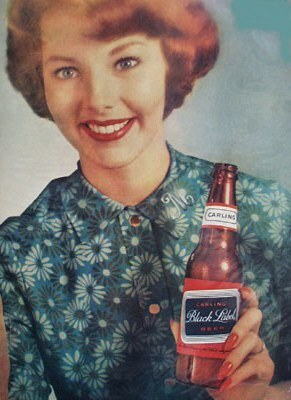 I grew up after all of the "Mabel" commercials were a thing of the past, However even to this day when people see me drinking a Carling Black Label, people who say they haven't seen Carling Black Label in over 25 years, still yell out "Mabel, Black Label" . All of that made me wonder back then in my teen years what she looked like, what the commercials sounded like, and whatever happened to "Mabel." Is it any coincidence that when Carling changed marketing strategies and got away from the "Mabel" theme that the sales started to drop ? Sure makes me wonder ! I have a couple of the old television commercials in my collection, but as of the moment, I don't have a means in which to put them on this site as they are either on video tape or write-protected cd-rom. Mabel was everywhere....tv, magazines, retail "point of sale" ,movie theaters, trays, signs, glassware, billboards,coasters, and even cigarette lighters and restaurant place mats. ! See more of Mabel on the images page.